ROSS Controls is pleased to announce the new MD3™ Series Modular FRL’s. 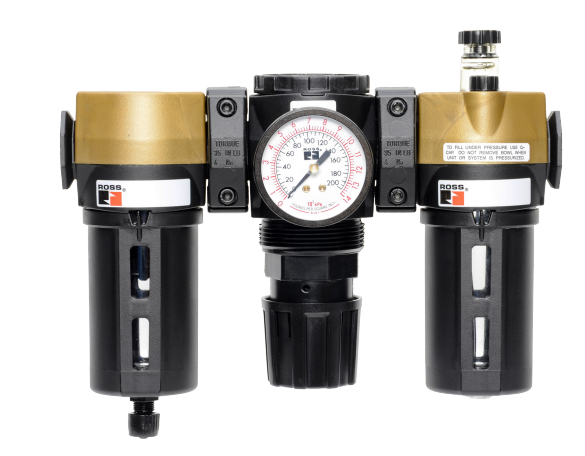 These air preparation products can be modular or inline mounted and are available in a variety of colors, materials, thread and size options. The flexible MD3™ series is sure to be a popular choice for a variety of applications. ROSS CONTROLS® announces the new 5/2 CROSSMIRROR® Series Pressure Return Double Valve. A perfect solution for shearing, forming, cutting, clamping, pinch-point, two-hand control (ISO 18351 Type 3 C) and cylinder return-to-home position applications, this new valve delivers enhanced safety and dependable performance. ROSS CONTROLS® announces the M DM2®, its new control-reliable soft start double valve with an integrated soft start function. This modular valve unites the proven ROSS DM2® function with an innovative on-board soft start capability that allows gradual introduction of air to the system when the valve is energized.